The Princeton Environmental Film Festival, scheduled this year for March 19-29, has other film showings scattered through the year. One is coming up this Friday at 7pm, with a showing of "Dam Nation" at the Princeton Public Library, followed by a talk by StonyBrook-Millstone Watershed Association staff. They've been trying to get a couple small dams removed along the Millstone River, which the StonyBrook merges with at Carnegie Lake. The Millstone flows towards the ocean, past Kingston and Princeton's wastewater treatment plant, then merges with the Raritan River 20 miles further downstream, just before contributing water to the treatment plant from which Princeton's drinking water comes. This is a working river, serving us in so many ways, but it also has some nice scenic stretches, almost all of which can also be accessed by riding a bike along the canal towpath. Removing dams allows migratory fish like shad and eels to get where they need to go. One question I'd have is, if the lower dams are removed, how do the fish get over the Carnegie Lake dam? You can get to know the mighty Millstone a bit in a post about a fun kayak trip we took down the river four years ago--our journey to the source of Princeton's drinking water. Some of us laid low by the flu hadn't noticed Lake Carnegie's quiet transformation this week into the ultimate sustainable ice rink. Sustainable, that is, in terms of low carbon footprint. A friend whose home overlooks the lake called to tell me, and the town hotline at (609) 688-2054 confirmed the good news. We dug out our skates, went down to have a look, and found the ice looking right back at us in its own mysteriously retinal way. "Here's lookin' at you, kid." 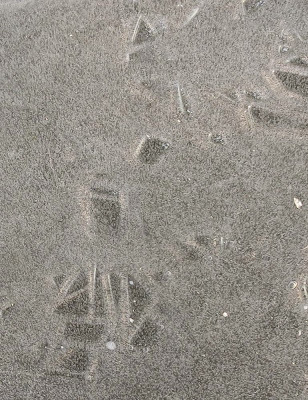 Along the far shore, the ice was white with lots of smaller ganglial patterns below the surface. 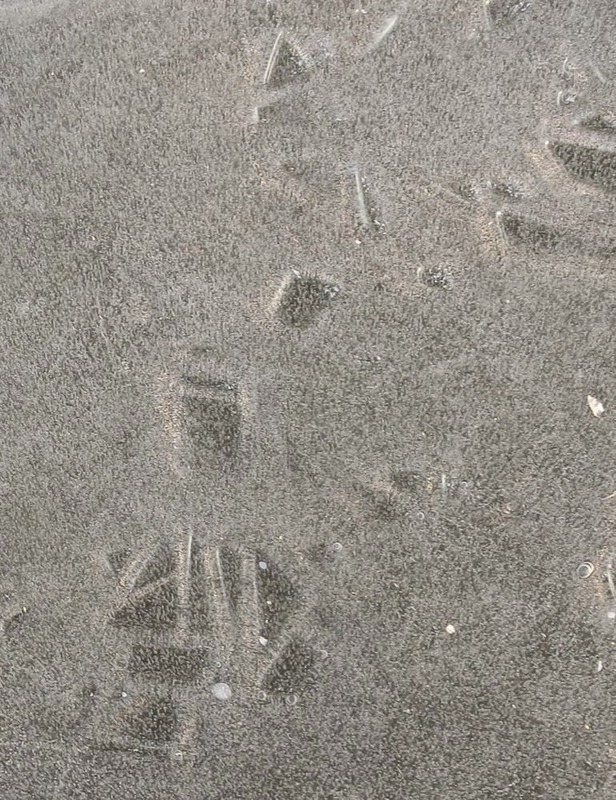 This large vein of dark ice, too, was sealed beneath a smooth skating surface, like a giant coffee table with patterns protected by a glass top. 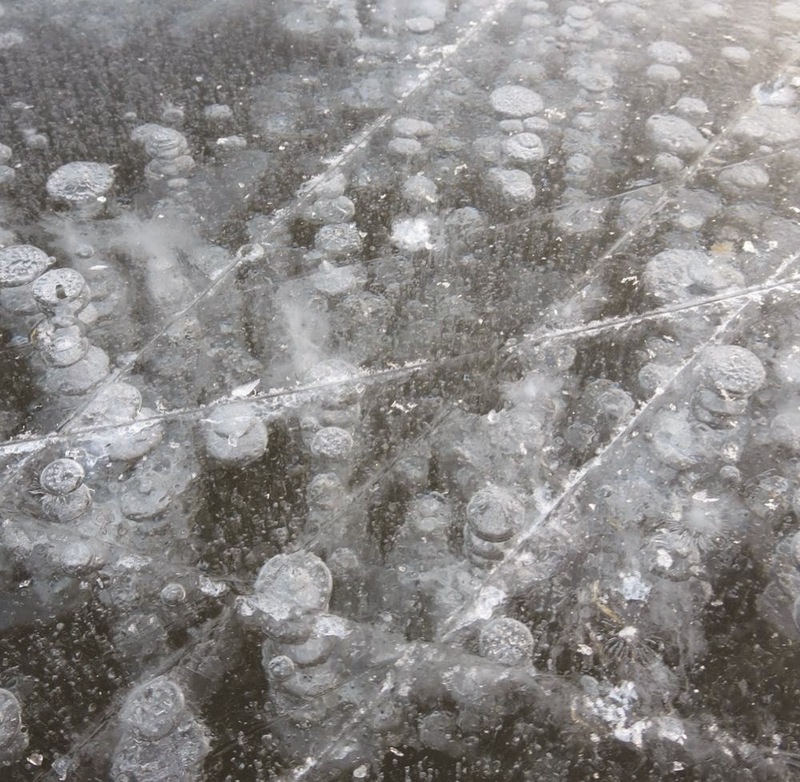 Bubbles large and small were suspended in solid ice. from some unknown source below. Elsewhere, shallow imprints suggestive of goosefeet but too varied in size and shape, possibly created as the surface softened then hardened again. 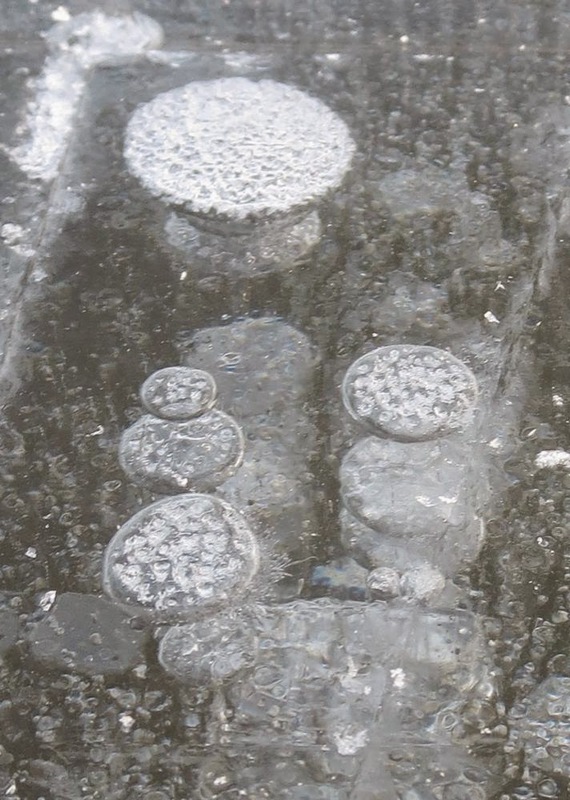 and larger plates of ice more easily explained as fragments from an early freeze that broke apart on a warm day, then were captured in a more recent, deeper freeze. This shard was ten feet long. A white line of crinkly ice extended towards the Harrison Street bridge, suggesting a seam where giant plates of ice rub against each other. Every now and then, in various locations on the lake, an indescribable sound would zip by beneath us--not a big crack or a boom, but an elastic sound, more like when you kick a doorstop spring. Probably arises out of a slight shift in the ice as it adjusts to forces of expansion and contraction. The beavers sure looked like they'd been busy over near the towpath, but more likely maintenance crews have been doing tree work along the canal and simply broadcast the chips rather than haul them away in a truck. The glow of the western sky captured the feeling of gratitude for water's wizardry, as some particularly organized families and friends gathered to share a warming drink beneath the spreading limbs of an ash. 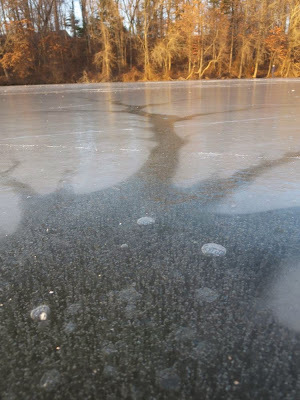 I'm just re-emerging from a long bout with the flu, and a friend calls and says the ice is glorious, deep and dark. Check Princeton Recreation Dept. hotline, (609) 688-2054, for details. Playground equipment is typically a 3-dimensional structure built on flat, 2-dimensional ground. What happens when the ground itself becomes 3-dimensional? The result is that the ground itself becomes playful, so that the kids interact at least as much with the ground as with the play equipment, rolling down the slopes, exploring the play of gravity on the suddenly niche-rich topography. Though carpeted with artificial turf, the pockmarked appearance is to some extent more natural than flat, given that American forests become pockmarked by the uprooting of trees in storms. The park is in Washington Square in Manhattan. Growing up next to Yerkes Observatory, on the outskirts of a small town in Wisconsin, I would walk to school along a path used fifty years prior by the astronomer Edwin Frost to get from his home to the observatory. He became blind later in life, but would still walk through the woods to his office every morning. A wire was strung from tree to tree along the path, so he could guide his way with the crook of a cane held against the wire. Pieces of the wire could still be found in the trees when I was exploring around there as a kid. For many years, my youthful mind mixed one Frost with another, believing that the Frost who walked that path was Robert Frost, the famous poet. There were many wildflowers, planted or growing naturally, along that path. Walking it years later, in my twenties, the canopy of oak/hickory was full of birdsong, one of which sounded just like a lick Charlie "Bird" Parker would often end his phrases with, using the third, fifth and second notes of the major scale. Old articles, easily found now on the internet, describe the blind astronomer's ability to tell temperature by the tempo of cricket sounds. One goal for the new year, along with working on trails at Herrontown Woods, is to revive some of these stories of connection to nature. 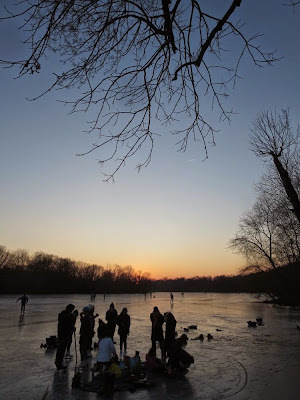 A happy new year to all whose paths cross with Princeton's nature and PrincetonNatureNotes.